The Greatest, Most Difficult, Most Prestigious Grand Tour of a Mythical Country in the Whole Wide World. A lot has changed in Sufferlandria since last year’s tour. It now has it’s own website and a citizens exam. There’s a range of local produce, and of course new videos. Thankfully some things haven’t changed though, such as Grunter von Agony’s commitment to misery and suffering. 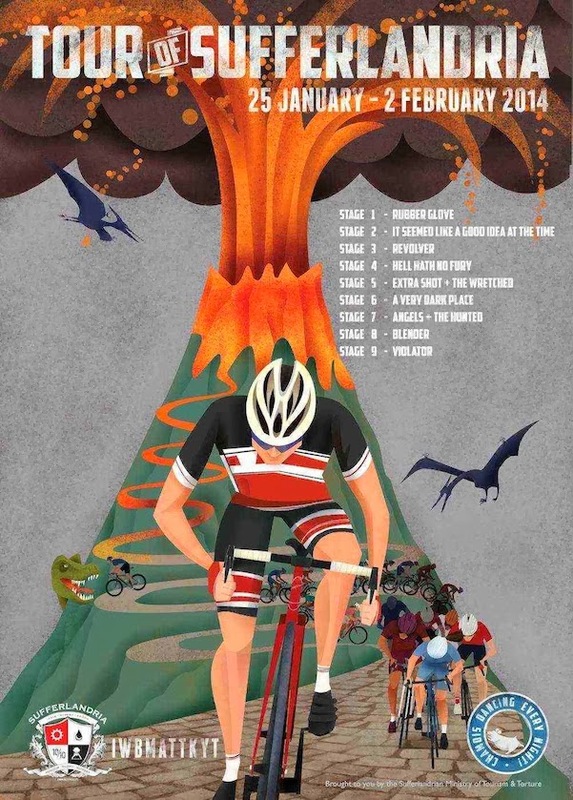 So it was clear that the 2014 tour would be longer, tougher, and yes, involve more lava. Stage 1 was a true piece of evil genius. What could be so bad about a simple 1 hour test? 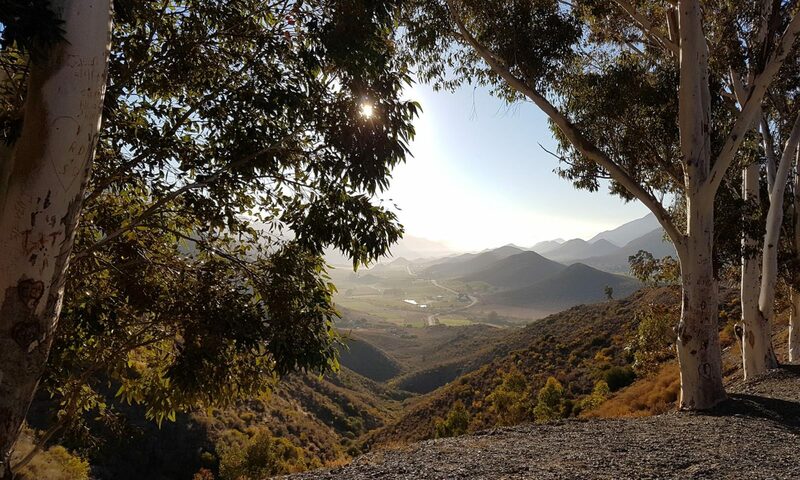 Well, ordinarily nothing – you just beat yourself into a pulp, slide off the bike into a sweaty heap, and when you have regained enough strength, smile at your improved FTP. No such smiling this time though, that increase (8.5% in my case) would ensure that the 8 remaining tour stages would have their suffering levels upgraded by the same percentage. Evil. Genius. “You could just back off a little and not give it everything” was Yoli’s comment. Luckily GvA was out of earshot – I suspect those words were close to treason, and as the partner of a citizen of Sufferlandria I’m sure the full force of the nations laws would be brought down on her. With epic bad planning, we were away on both Saturday’s of the tour. Not much of a problem at the start because I could get Stage 1 done early due to Sufferlandria’s peculiar 50 hour day at this time of year. I knew it was going to catch up with me later in the week. I was rather complacent over Stage 2, what could be nicer than a couple of hours in the indoor trainer on a Sunday. It turns out almost anything would have been nicer than ISLAGIATT with an 8.5% uplift in target power. Seriously, anything, even towing a bull dragging an anvil backwards up a hill. It was as serious battle to keep the power on over the last climbs and the flat race to the finish. Worse was yet to come though, much much worse. Some very tough stages lay ahead, and Monday was clearly my best window to get into the breakaway, get a day ahead of the pack, and at the same time create the needed clear day for the following Saturday. Best window, but not easiest by any means – the task involve a 5am start to thrash out Stage 3 (Revolver) , and an evening attack on Stage 4 (Hell Hath No Fury). Those alone were bad enough, but in the middle I also had my weekly core strength session with Andre, my trainer. Revolver was rough, it always is. And barely woken up legs did not help any. But it’s a quick death, a rapid succession of bullets from a firing squad. The pain is soon over. HHNF is another matter – one of the best and toughest videos, and one I avoid unless I’ve been seriously bad an need the pain. I didn’t need the pain, especially with a 2 hr stage the day before and 45 minutes of gunfire to the legs that morning. But I got it anyway, The Monster and her friends made sure of that. Tuesday brought with it one of two stages I was genuinely fearing – Stage 5 a double header of Extra Shot and The Wretched. As someone on the Facebook forum said, there is no warmup, Extra Shot is the warmup. A warmup at a threshold of 9/10, what evil and twisted sadist could come up with such a thing. Ah yes, GvA, that’s who. It hurt like hell, and then it was time to switch videos, and hurt like hell some more. Wretched was more like “wretching” by the end. The tour was properly underway now – day after day of punishment. The organizers were doing a good job at giving some hint at what a Grand Tour feels like. Some truly insane part of me had planned to do the usual Club 100km on Wednesday, and then Stage 6 later that evening. There was nothing spare left in the legs to contemplate that, not without giving A Very Dark Place less than 100%. And less than 100% is simply not tolerated, not on this tour. The cave was deep, and the hole just kept getting deeper and darker. Stuff the cobbles, and Cancellara, I just couldn’t slog along trying to keep up, I had to lead out the break, get out in front, it was going to be tough so it might as well be tougher. Despite being shattered, I was rather pleased with the effort – 8th rider to complete the stage. In the break now for sure, and only 3 stages left. Only 3 stages to go – almost there! Not even close. Stage 7 was a Sufferlandrian monument to misery. Angels and The Hunted back to back. No rest in between, only time allowed was to switch videos. Two water bottles sat beside the bike, and an energy bar. The fluids would be enough, especially with an electrolyte tab in one. The energy bar was purely there for show. It would do nothing real to help get over the wall ahead, apart from maybe lift the spirits a bit. On their own, each of the allocated videos are tough. Add the 8.5% extra power needed, and they’d be a real challenge. Put them back to back, and what lay ahead was 2 hours of probably the highest intensity I’ve ever experience on a bike. On anything for that matter. My performance on Angels wasn’t bad, especially considering the stages already done – a very close match to the target power curve. The Hunted was another matter entirely – one long struggle from start to finish. I rode it, I kept up, and it came to an end. I can’t really say much else, can’t even remember much else to be honest. Just a fear of dread that I was dropping back, and an ocean of pain trying to hang on. Hard to say if I enjoyed Stage 8 because it was the last but one, or because I was getting stronger, or even because it’s so well designed that as it gets tougher so you are building up speed and strength. Regardless of the reason, it was a breeze, and absolute blast. Every one of the four course was a painful but rewarding dish of delights. I’ve never failed to rip the power off the chart on the last of the time trial segments, and even with the new FTP and 7 stages before I shredded the chamois. Eight down, one to go, and Monday’s double header meant a rest day tomorrow too. What a feeling. What a feeling – after a Saturday and Sunday morning of camping, fun, and drinking, I really needed 64 sprints on the trainer in one hour. No really, that’s exactly what I needed. It was at least an excuse to ride Violator, which I’ve owned since release and never ridden. For some reason the rapid sprints never appealed to me. They should have, it was awesome. The first two sets of sprints I totally crushed, but the third was a real battle. The accumulated effect of the previous segments and the miniscule rest periods between sprints made if very tough. But it was over quickly – too quickly in a way. All too soon I was wiping sweat off for the last time this tour, and looking at that 9th Stage cup turn orange on the web page indicating the completed tour. Last year’s was fun and hard. This year’s was even more fun and even harder. The Facebook community was also way more active, adding to the sense that we were all really racing together, accomplishing something rather special. Who on earth rides 364km on an indoor trainer in a week? Who spends 12 hours pedaling indoors going nowhere when it’s sunny and perfect cycling weather outside? A Sufferlandrian, that’s who.